What happens when you are interested in a particular period in time? If you like to read, you will be drawn to books about that era. When I was writing My American Eden, I was tasked with researching Colonial America between the years of 1635-1660. It began when I found a tidbit in a history book about a woman who walked into Boston with her shroud in hand. She walked to the hanging tree twice, had the noose around her neck twice, and her face covered with her Pastor’s handkerchief twice. A last-minute reprieve by the Governor spared her the first time: the second resulted in death. This story struck me as one that every American should know. 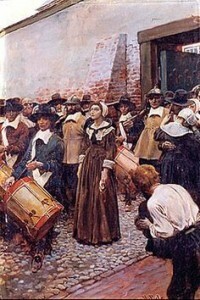 Because a law was passed banishing Quakers on pain of death, Mary Dyer challenged it with her life. As I began researching the event, I quickly realized that history is far from simple. I found that perspectives differed depending on the author. Then something else came to light. The story tended to change over time. Quaker historians had one perspective, British authors had another, and then American academia added more confusion to the mix. I began to wonder if history is based on myth or fact and wondered how to find the truth. Official court documents, dates and times, all came up with discrepancies. Initially, I was obsessed with every detail. My first draft ballooned to eight hundred pages. 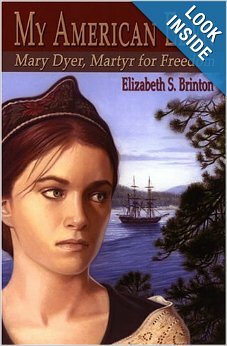 When I learned that Mary Dyer traveled back to England and spent seven years there, I had to accept the challenge of understanding the English civil war. The Puritans and the Roundheads, the rise of Oliver Cromwell, and his destruction of Parliament were vague recollections from high school. I turned to my favorite historian Sir Winston Churchill. It was his description of a rising merchant class gaining sufficient power to challenge the established ruling class that piqued my interest. The more deeply I delved into the conflict, the more understanding I gained of what unfolded decades, and then centuries later. I learned of that the roots of the American Civil War stretched back to the events of the 1650s. One side, the Royalists, eventually gravitated to Virginia and the southern United States while the Puritans sailed to Boston. The events in New England also had an effect on the American Revolution and the founding fathers. 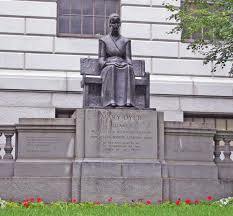 Mary Dyer’s protests did not go unheeded. When Charles II was restored to the throne in 1660, he immediately passed a law forbidding such discrimination. As we watch history unfold, try as we might, it is often difficult to find the truth. When asked if history would be kind to him, Winston Churchill replied that it would indeed because he intended to write it. As a child growing up in a military family in the post-war fifties and sixties, the shadow of war hung over the conversations by the adults. Watching the first reports of the news from Dallas, fifty-two years ago today, I had nothing but questions. At that point in time, I was obsessed with the Nancy Drew series. Even in the midst of the emotional wallop that hit us all regarding the assassination of the President, I sensed a murder mystery. People crave a simple explanation, but I feel we must be sleuths. What could be murkier than the events of November 22, 1963? One book leads to another; facts are disputed, and some facts are indisputable. The deeper one delves, the more confusion one is likely to find until at last the truth emerges. Should we accept the fact that we will never know? I have never thought so. The Unspeakable by James W. Douglass and The Devil’s Chessboard, by David Talbot have shed new light. Both books are thoroughly researched and beautifully written. 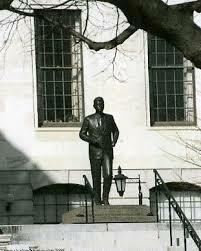 Two statues in front of the Massachusetts State House: One by Sylvia Shaw Judson depicts Mary Dyer, and the other is Isabel Mcllvain’s President Kennedy. This week we will gather with friends and family remembering those first families who came to the New World seeking freedom. Some of us will pray for those around the globe who are fleeing terrible circumstances and conflict. Hopefully, we will all give thanks for the simple things: a roof over our heads, a warm house and a bounteous feast on the table. I hope we will all remember to cherish freedom too. 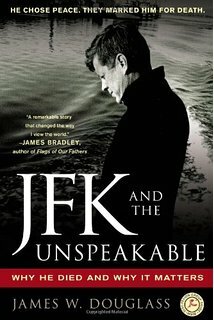 This entry was posted in Historical Fiction, Non-fiction and tagged American History, Colonial history, President John F. Kennedy, Thanksgiving on November 22, 2015 by Elizabeth Smythe Brinton.